The average American spends over five hours watching TV every day. From movies to scripted shows and sporting events to local news, time in front of the television is engrained into our everyday life – and the time before we go to bed at night is no exception. We surveyed over 2,000 people about their TV watching habits before bedtime to learn how many Americans are tuned in to their TVs before falling asleep, how often they leave them on at night, and what they watch. Continue reading to see what we discovered. Of the over 2,000 people surveyed regarding their TV watching habits before bed, we found that 58 percent admitted they watch TV before hitting the hay. While the idea of falling asleep to reruns of “The Golden Girls” or the latest episode of “The Bachelor” may seem innocent enough, the reality is viewers may be significantly interrupting their sleeping cycle. Research has shown that the artificial light coming from our modern electricity (including the TV) can emulate the natural light from the sun that our body uses to keep track of when it’s time to release the melatonin that helps us fall asleep. Too much artificial light, especially right before we think we might try to fall asleep, can disrupt the REM cycle and our ability to fall asleep naturally. On average, people who don’t watch TV before bed report getting 10 extra minutes of ZZZ and an overall higher sleep quality. 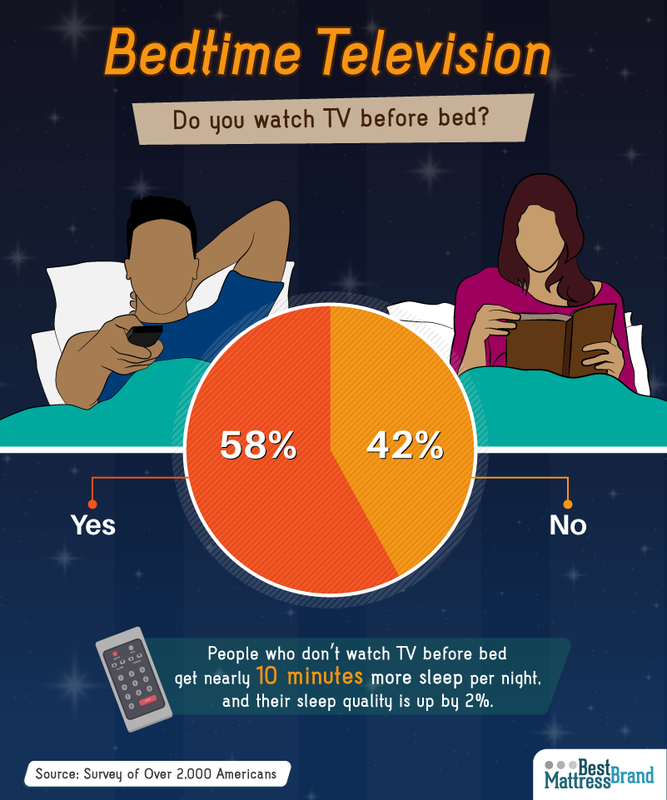 Of those who told us they watch TV before they went to bed, almost 37 percent said it was part of their nighttime routine every day of the week. In fact, the fewest number of survey respondents (just over 6 percent) told us they only watched TV before bed once a week, while almost 14 percent said they wound down their evening with television programming five times a week. Most participants (22 percent) told us they start watching TV around 10 p.m., and almost 18 percent of viewers (regardless of when the TV is turned on) turn it off by 11 p.m. Nearly 17 percent watch for 30 minutes longer, and over 10 percent watch TV until midnight on average. Trouble sleeping at night may not be as uncommon as you think – between 50 and 70 million Americans report some form of sleep trouble. Research recommends turning the TV (and other electronics) off at least 30 minutes before bed to help you get the best sleep possible. Comedy seems to take the top spot when it comes to what participants like to fall asleep watching. Over 20 percent of survey participants like to fall asleep while watching “Family Guy,” while just over 17 percent said they prefer winding down with “American Dad.” Ironically, writer and producer Seth MacFarlane created both shows. Sharing the bedtime TV market with MacFarlane was fellow animated comedy “Bob’s Burgers,” indicating that many people prefer falling asleep to casual, lighthearted television. Less than 10 percent indicated dramas like “Law & Order: SVU,” “Grey’s Anatomy,” or even the local news helped them get to bed. Our study shows that comedy may take the cake for how people like to fall asleep, but it’s documentaries that make them the most tired. Over 29 percent of those surveyed said documentaries, perhaps involuntarily, made them the sleepiest, followed by comedies and the news. More and more people today watch television on something other than their TV, but when it comes to pre-bedtime rituals, almost 70 percent of respondents who watch TV before bed like to do it with an actual television rather than their computer, smartphone, or tablet. Most also told us they turn off the TV before they close their eyes, and over 17 percent said they keep their TV on a sleep timer (which may indicate they fall asleep while it’s still running and let the TV turn itself off). Over 24 percent of respondents admitted they let the TV run through the night, even if they sometimes wake up later to turn it off. This behavior is especially problematic given that research indicates falling asleep in front of the TV, not just watching before bed, can lead to depression. You may even become dependent on the TV to help you sleep, as 8 percent told us they found it extremely difficult to fall asleep without having first watched TV. About half of respondents said their significant other didn’t enjoy falling asleep with the TV on, though. More millennials watch TV before bed than any other generation. 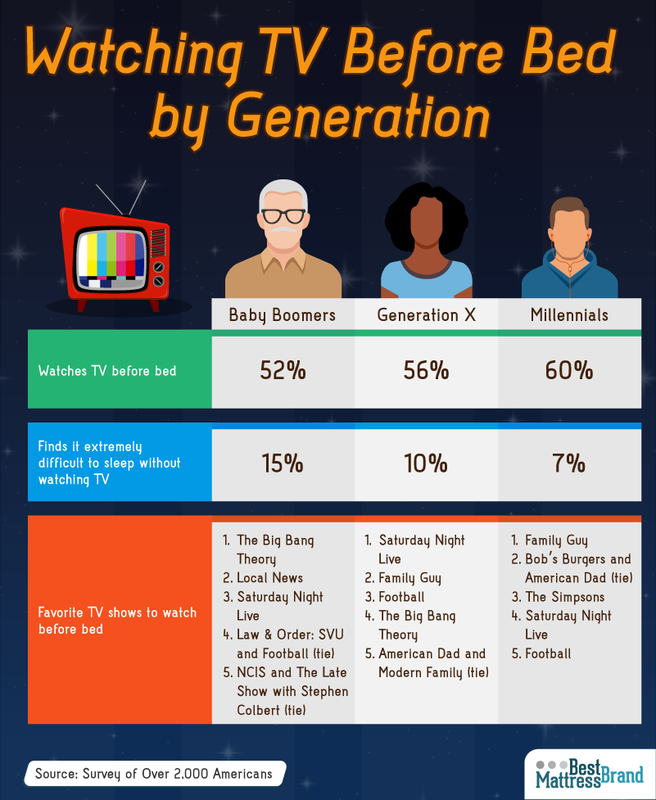 Our survey found that 52 percent of baby boomers, 56 percent of Gen Xers, and 60 percent of millennials acknowledged watching TV before falling asleep. Despite millennials watching more TV at night, 15 percent of baby boomers find it tough to fall asleep without watching TV. All three generations chose a comedy for their top late-night TV choice. Millennials had animated comedy programs in their top three picks for favorite shows to watch before bed, while Gen Xers told us that “Saturday Night Live” was their preference for nighttime TV. Baby boomers also picked a comedy as their program of choice for falling asleep but were also more likely to indicate local news and serialized dramas like “Law & Order: SVU” and “NCIS” as shows that help them get to sleep. Unfortunately, watching shows with violence or suspense can lead to a greater feeling of anxiety before bed, making it even harder to get a good night’s rest. Women were more likely than men to watch TV before going to bed. While 56 percent of men said falling asleep in front of the tube was regularly part of their bedtime routine, 61 percent of women told us the same. Women were also more likely than men to find it extremely difficult to fall asleep without watching TV. For those who struggle to fall asleep in general, mental and physical side effects can occur. From staving off memory loss to decreasing the chances of a repressed immune system, getting a good night’s sleep is more important than simply feeling well-rested in the morning. Men and women both agreed animated comedies were the way to fall asleep while watching TV, and while men also said sports programs helped them get to bed, women were more likely to express watching dramas at night to do the same. While more than half of those surveyed like to watch TV before bed, our study found participants who were either single, divorced, or widowed were more likely to fall asleep watching TV than those who were in a relationship or married. 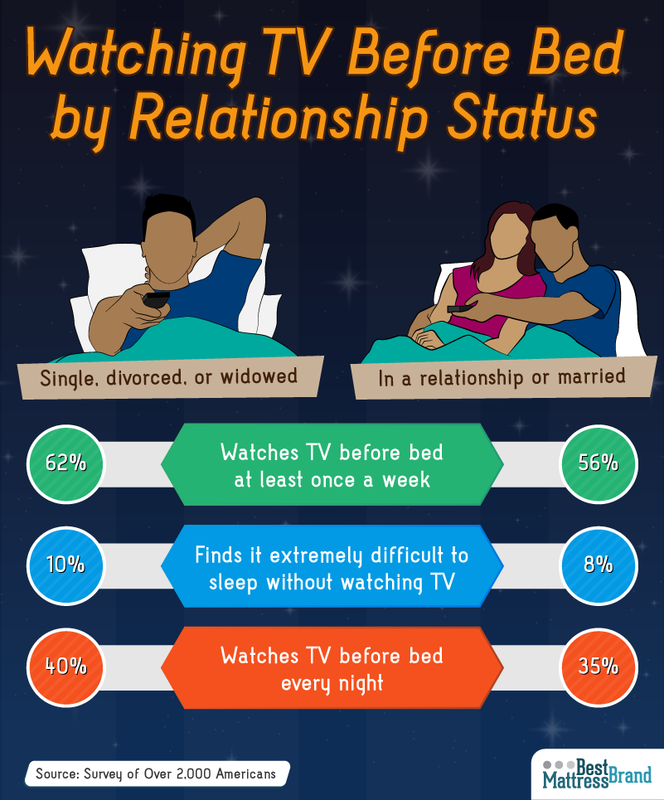 Fifty-six percent of those with a significant other watch television before bed, compared to 62 percent of those who aren’t currently in a relationship. One out of every 10 of those who weren’t in a relationship also were more likely to find it extremely difficult to fall asleep without watching TV, and 40 percent said they used television shows to help them sleep every night of the week. Outside of their TV watching habits, research has found that couples in a relationship, on average, sleep more than those who are single, and that for those in a relationship, getting better sleep at night helped them feel happier in their relationship the following day. Across the U.S., most Americans fall asleep either while watching television or having it on in the background throughout the night. Despite research indicating the negative effects of habitual TV watching right before bedtime, we found those in the Northeast were more likely to do so than anywhere else in the U.S.
Over 59 percent of those in the Northeast and Midwest regularly watch TV before bed, while just over 57 percent in the West do the same. Survey participants in the South were the least likely to utilize television before bedtime, but still had almost 57 percent affirmative responses. Getting a good night’s rest isn’t just about how you feel in the morning. It helps control healthy brain function, our emotional well-being, and elements of our physical health. Getting the best sleep possible doesn’t just mean hitting the recommended seven to nine hours either; it means making sure you have quality sleep habits to maximize the time your body is resting and recuperating before tomorrow comes. At Best Mattress Brand, we’re dedicated to helping fellow sleep seekers get better rest. Whether you’re firmly opposed to watching the tube as you prepare to snooze, or can’t nod off without it, we’re here to help you find the right mattress at the right price. Plus, we collect and share great sleep tips and tricks to help readers do a better job of dozing, from mattress reviews to sleep guides for those with injuries. Check out these resources and more right here. 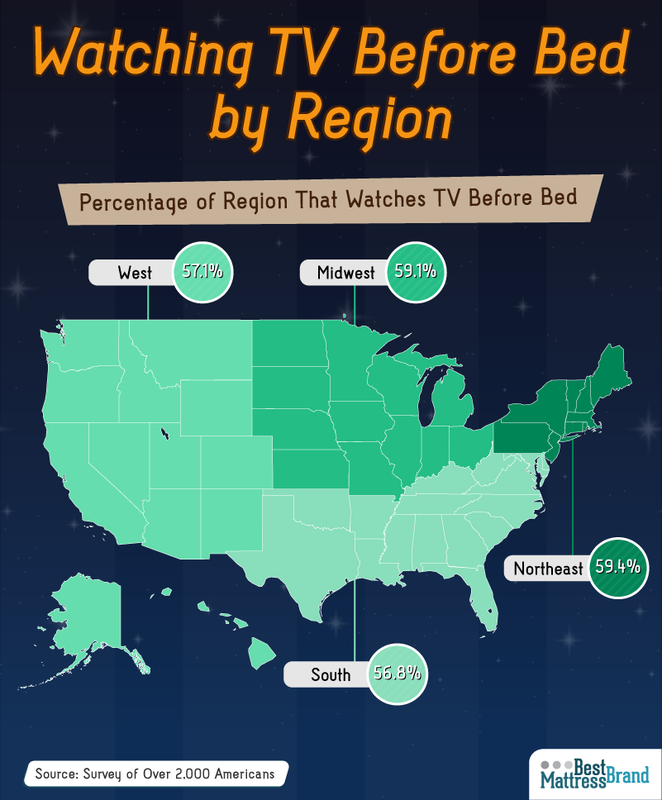 We surveyed 2,007 people in the U.S. about their TV habits before bed. Don’t doze off on properly sharing our content for noncommericial use – just be sure to link your readers back to this page.